This post is in partnership with TheRTAStore.com. If you’re about to embark on any organized-dream-space renovation, we’re offering a YBH promotion below! Over the course of the last few weekends, we’ve been devoting our time to realizing our Scary Room closet plans – and it’s getting there! The upper cabinets are in place, the bi-folds are trimmed, and after a full day with our table saw, our 3-piece trim is off the floor and on this one wall. Each of these tasks were a project in itself, but today we want to focus on our cabinets, because you guys, we created so much storage where there was once none. All that space that’s typically wasted above a closet? We’re using it! It’s the stuff storage dreams are made of. As a refresher, we landed on a pair of 18″h x 30″w x 24″d Newport White cabinets from TheRTAStore.com. Typically, cabinets of this depth are used as extra storage above a refrigerator, but because they were so deep, they were perfect for this application, too! We’ve used The RTA Store previously for our laundry room renovation, and we’ve been so thrilled with their performance, it was an easy choice to use them again. As the name R-T-A implies, the cabinets arrive flat packed, ready-to-assemble. Finally, the back piece was pushed in, and we used the screws provided to firmly attach it using the pre-drilled holes. Because the doors and clips are already on all of the pieces, it took us no more than 5 minutes to build each one! During the closet widening, our contractor also framed out the opening for our cabinets. We asked him to create an opening that was 60 1/8″w x 18 1/8″h, which we knew would create a super tight fit. With the cabinets built, we crossed all of our fingers, and we very carefully slid them into place – and it was just right. Yeah! So much storage! The cabinets span a width of 5′, and their 2′ depth will be a perfect home for my sad sewing machine – among other things. They aren’t screwed in place – yet! – but once they are, we’ll caulk all the way around to eliminate the barely-1/8″ gap. The Newport cabinets come standard with soft close hinges, and the doors are highly adjustable to ensure level. With these cabinets and our laundry room cabinets, we also opted into their 5-year warranty plan with Guardian, which protects against accidents and is backed by AIG insurance. To be honest, I’m usually the first one to skip a warranty plan, but in this case, we went for it after discussing with an RTA designer everything it covers – from a scratched door to a spill that won’t budge, to a damaged hinge or drawer glide. The part would be repaired or replaced at no charge. There are two levels of protection to choose from (more on that here), but the Platinum Plan is a full replacement warranty, meaning that if something happens and that style of cabinet is no longer available, then we have the option to have everything replaced with a comparable style/finish! 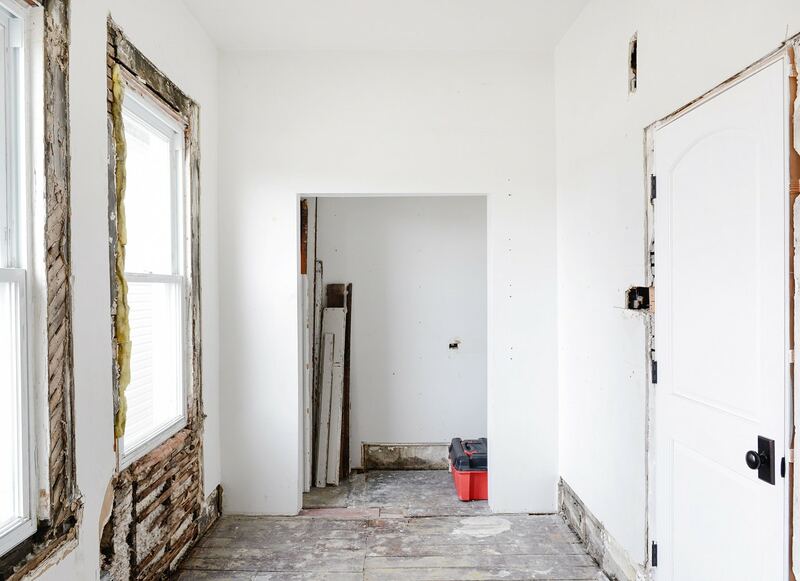 If you’re about to embark on any organized-dream-space renovation, we’ve had a great experience with TheRTAStore.com, and we’d recommend them in a heartbeat. We heard through the grapevine that starting next Friday, March 24th, they’re having a big tax-time sale, with savings of up to 40% (our cabinet style included)! 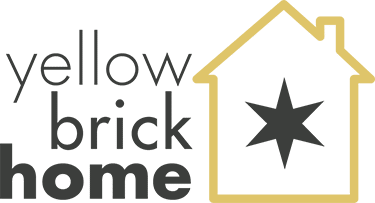 To prepare, you can get started by ordering sample doors right here, and they’re offering Yellow Brick Home readers BOGO on all sample doors when you use the promo code YBHBOGO at checkout! For your reference, these are the Newport White, and our laundry room is outfitted in Aspen White. We couldn’t be happier with the added storage, and I’m simultaneously looking forward to and dreading the rest of the trim in this room. Longtime readers know my true feelings about trim work, but thank goodness for Scott – he actually enjoys this job. More on that soon, but our progress so far has already made a world of difference! This post is in partnership with TheRTAStore.com. We used two of these extra deep cabinets from the Newport White line. 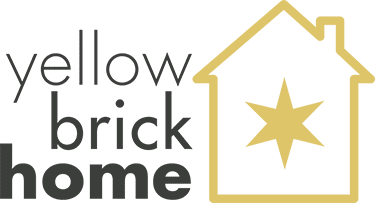 Thank you for supporting the brands that allow us to bring fresh content to Yellow Brick Home! are you planning a post on how you trimmed out the plain slab bifold doors? what a difference; they look great! i’m looking forward to seeing them all painted up. This looks awesome! Are you going to write about installing bi-fold doors? I’d love to know if you did anything to recess the top track. I have 4 old doors that I want to make into bi-fold doors and I make stumped on what to do with the 1″ tall track for these heavy doors. My father used to say I had an obsession with putting closets in our home. When you have an older home, closet space is at a premium! Seriously this is fantastic, and I’m so glad you used the room’s height for extra storage. Looks rad.